This mallet is one of the best new ideas to come along in years, but also one of the most difficult to write about. You really have to take this great little mallet in your hand and work with it to appreciate what it can do. 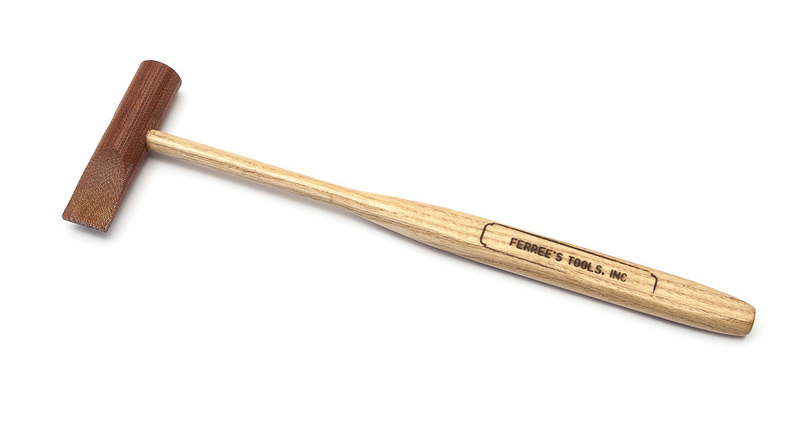 Cliff Ferree made one of these mallets for his personal use some time ago. He liked it so well, that he wanted to make it available to his customers, too!The hardness is between a brass hammer and a rawhide hammer. It is made of rolled canvas and high pressure phenoilic-type mica. This is the same substance used to make printed circuit boards used in space projects where reliability and strength are so important. It delivers a little more punch than a rawhide mallet, but will not mar a surface like a brass hammer or a dent hammer. The precut tapered edge is thinner than normally used on a rawhide mallet and therefore, concentrates more power directly to the target. Some of the repairmen that have tried this malletdescribe the feel as ?snappy.? We are sure that you will enjoy using this space age mallet yourself, and of course, trying this hammer will make you a believer. This really is a ?try-it-you?ll-like-it? tool.